NoSwing is an automated control unit for the frequency converter of an overhead crane. The sensor continuously measures the crane’s hoisting cables to ensure that they remain in a vertical position. which means increased efficiency handling times are reduced. NoSwing has been developed to eliminate swing when using an overhead crane. In addition, NoSwing prevents overhead cranes from being used incorrectly (e.g. as a result of dragging instead of lifting). NoSwing even works in strong winds. Easy to use NoSwing is easy to use. the frequency converter, without the crane operator having to do a thing. NoSwing is reliable and incredibly durable. Moreover, NoSwing has low installation, service and maintenance costs. NoSwing even reduces hoisting cable wear. An overhead crane fitted with NoSwing operates in such a way that swing or misuse of the overhead crane can no longer occur. This means that the risk factors associated with lifting are significantly reduced. With NoSwing, accidents at the work place can be prevented. Since 2017, Gigasense is the worldwide distributor of NoSwing® anti sway product for sway control in lifting operations. Our wide distributor net, with 44 selected partners in 35 countries on six continents will take care of local requests for quotes. The service and technical product support will be handled by NoSwing Oy in Finland. Response time is therefore longer than our standard 24 hours. 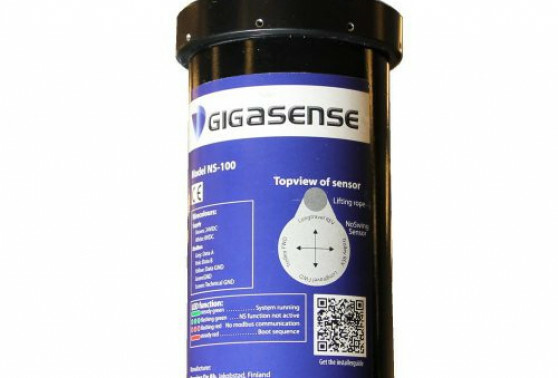 You are welcome with your support questions to Gigasense in Sweden support@gigasense.se and we will make sure to connect you to a support engineer at NoSwing Oy.